The trike presented here has had a Zeta assist unit as well as an electric powered trailer so here is an attempt to expand on the options and design of electric assist human powered vehicles. 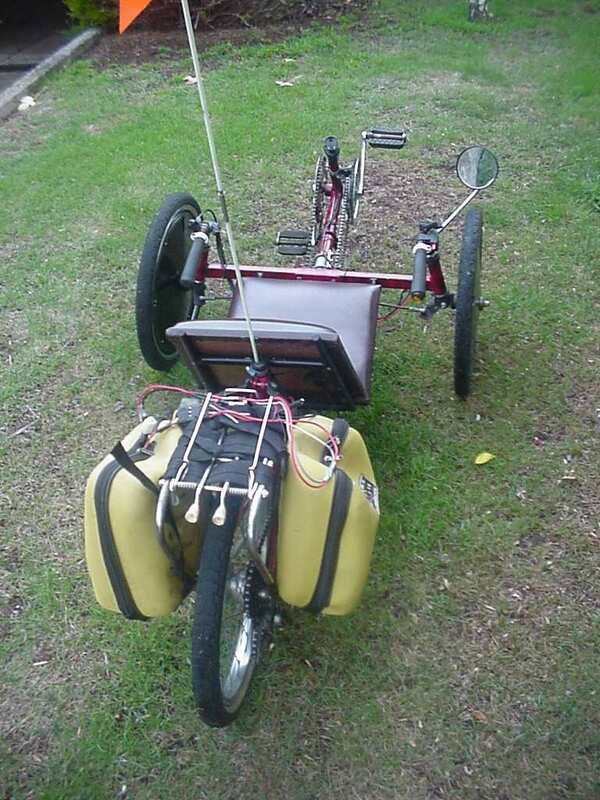 The motor was also installed on a Delta recumbent Trike. The motor is connected to the drive-train used by the rider by installing a chainring (48 teeth) normally made for the right side onto the left. Adjustment of the chain is achieved by sliding the electric motor backwards/forwards along the front boom. A bike single ratchet sprocket is mounted onto the motor output to allow for the rider to pedal without assist. When the motor is running the pedals turn - in other words, you can't stop pedalling with the motor on. It takes a little while to get used to and has given me a few surprises when the pedals spin unexpectedly but I'm sure I will get used to it. You may notice the motor hangs quite low - this I can fix after doing some testing to see that this setup all works satisfactorily. My first choice would have been to mount the drive system directly onto the right hand chain to minimise weight and complexity but it didn't work out so easy to achieve. The sprocket would undo under power. The chain return is fairly close to the drive side and would have needed additional routing. Side to side movement of the chain would be restricted maybe not allowing enough movement for the front 3 gears as it's fairly close to the front drive sprocket. No bike computer - yea I know, it got stolen. Automotive exhaust clamps hold the motor to the boom. Ignore the wiring mess on the carrier - I'll tidy that up soon and am using a wiring loom from a past project. Batteries are Portolac 12v 24AH Gel mounted on both pannier bags for a total of 24v. A 24v relay is used for switching. Current draw is in the range of 10A to 15A. A switch is loose inside the left bag to disarm the motor when parking in public (and if the relay contacts weld together) and a fuse also installed but these will be mounted more accessible soon. The on/off switch on the right handlebar. So how does it go? Quite well actually. I've been riding a US Pro equipped recumbent trike for quite a while now and find this very different, mainly because I have available all the gears of the trike. (in this case 36 gears) The batteries are really too big (heavy) so on the flat it motors along in top gear easily but works pretty hard up the hills around my home. Latest addition is a soft start system (circuit diagram) using only a few electronic components. I've been using the trike without a soft start for several hundred k's and am not very happy with the stress the motor brings into the drivetrain when starting. My guess is over time the ratchet paws on both the motor ratchet and the drive train will be under sufficient stress to fail prematurely and the chain also may not last if the start up shock isn't addressed. Because the motor is driving through the pedal system this system should be treated as one would a tandem. In fact, on my system the electric motor is probably putting out more continuous power than the stoker on a tandem could so all needs to be beefier enough to handle this application. As this is only a soft start the concept is to use a relay and time delay it's switching using a large capacitor rather than expensive/complicated/error prone circuitry using electronics. When the on/off switch is pressed, power is fed into the motor through the large 50w resistor. Even this size resistor isn't large enough for continuous speed control but as it's only working for a second or 2 it barely gets warm. The 1 watt ~200 ohm resistor feeds power to the relay coil and capacitor so it's value is what affects the time taken for the relay to throw. The value of the 50w resistor determines how lazy the motor is when starting up. I fiddled round with several different ones before coming up with the 3.5 ohm value. If it's too high the motor won't spin up fast enough for the drive system to fully engage before the full power comes on. Of course if it's too low there is little use having a soft start. The resistor has cooling fins and a case that can mount to also aid cooling. The relay switches off immediately after the switch is turned off because the diode is shorting out the capacitor. The voltage of the electrolytic capacitor needs to be in the 63v range. This may seem high but there are high voltage spikes switching motors (which is a different story to switching for example lights) and this value is suggested so the capacitor doesn't self destruct. I played around with a few different values of capacitors (of ~ 1000 microfarad and more) and to be honest didn't find much difference in the time delay but it does need to be reasonably large. As mentioned earlier the value of the 1 watt resistor determines how long it takes to charge the capacitor. This capacitor draws all the current at first till it gets mostly full therefore stopping the relay coil from getting enough voltage to activate for a period. The resistor doesn't have to be very big as the relay coil doesn't draw much power so 1w should suffice. The relay coil needs to be rated for the voltage you are putting through it and the contacts fairly sturdy and certainly be rated for the max motor current expected. The diode is added because the capacitor is polarized and any negative spikes coming back off of the relay or the motor will blow this capacitor. Note the electrolytic capacitor and diode have to be mounted the correct way. The bar drawn on the diode goes to the positive side of the circuit and the capacitor usually has the negative marked on the body. Also note all the current going to the motor at all times is going through the on/off switch so this isn't ideal but still workable. If you are concerned about this another relay could be added so the main switch only passes the low current needed to switch the coil in the additional relay. * A Right hand crank and pedal is mounted on left side - will the pedal unscrew when riding? * It's just a little hard to reverse the trike as the motor has to turn also. Using a ex wheel chair motor with solenoid brake would make it impossible to push backwards. * It would be better with a speed control - on the flat it seems that the pedals just keep going faster and faster no mattr what gears are used..
* The gearing of the electric motor onto the drive train is especially important and it needs to spin the cranks at a cadence that is suitable to the rider as well. This is geared to spin about 60 to 90 rpm cadence which is about right for me. * On hills the motor slows down (of course) drawing more curent and therefore extracting more power out of the drive system. This is exactly opposite to what the rider would want as it's best to spin the cranks to save knees but as the motor is also connected to the riders method of powering the trike it isn't exactly suitable. * I ride this trike differently to the US Pro drive equipped trike - EG it isn't always easy to predict (or remember to) the gear needed to get going again. On the other trike I may use the electric motor to get moving then set the correct gears. This isn't possible with this trike as the motor also drives the cranks so it's more difficult to get going after a botched gear setup at stop. This drive system was designed from some inspiration by Neville Badcock, a Tasmanian that has built several such machines. Presented here is his electric and petrol powered bikes.